Yucatan Compass Consulting was created to help you live and invest in the Yucatan Peninsula region of Mexico. Whether you want to move here, invest locally or open a new business, we have a group of fully bilingual experts available who understand how things work so we can make your dreams a reality. We have over 15 years of experience in managing foreign investments and know the legal system in and out. We stay up-to-date on ever-changing policies related to immigration and taxation to help you avoid “surprises.” At the same time we are connected with the local community and can help you find anything from the best poc-chuc tacos (a local specialty) to building supplies. We know the challenges and fears associated with entering a market and culture that is new and are ready to help you make the transition as easy and stress-free as possible. Consider us your personalized “piece of mind” here in the Yucatan. Yucatan Compass Consulting offers legal, accounting, financial and ancillary services. Click here to view these services in detail. Alonso was born in Merida, Yucatan. He studied law at the Autonomous University of Yucatan (UADY) and graduated in 1994. He studied a year in Canada so you will likely be impressed with his grasp of the English language. Since 1999, Alonso has specialized in corporate law and foreign investment and is now managing partner of HP Attorneys in Merida and Playa del Carmen. He is accustomed to working with clients of all types and nationalities and strives for the highest levels of client support. His client list is a reflection of referrals from satisfied customers. Alonso strives to remain current on all areas of tax and foreign investment law. He continued his studies with an MA in Business Law and is currently pursuing a MA in Defense Management and Tax. His certifications focus on tax laws and legal issues for foreigners with business interests in Mexico. Javier was born in Merida, Yucatan. He studied Accounting at the School of Accounting and Administration at the UADY and graduated in 1990. He is a registered public accountant (CPR) in the General Administration of Tax Audit (AGAF) of the Mexican Tax Administration Service (SAT). Since 1990, Javier has served as managing partner of Cervantes & Associates- a public accounting and consulting firm. Cervantes & Associates specializes in foreign investment and works with international clients to guide them as they invest and do business in the Yucatan. He is also a member of the Institute of Chartered Accountants of Yucatan and the Mexican Institute of Public Accountants. He has extensive experience in auditing financial statements based on local and national tax policies. He regularly enrolls in continuing education programs to maintain his certifications and ensure he and his clients remain compliant with all state and national tax policies. 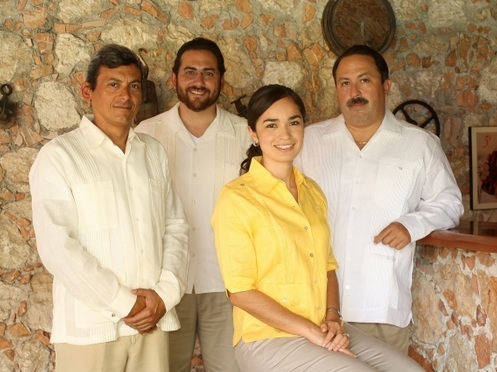 Elias is Yucatan Compass Consulting’s financial adviser. He is a Certified Public Accountant registered with the Mexican Institute of Public Accountants with extensive expertise in tax planning. He has had the opportunity to work with large and small organizations alike and managed as many as 50 direct reports. No matter what the size of an organization, Elias is ready to roll up his sleeves and get started because he knows where to look and what to do with what he finds. His focus areas are tax planning, cost-effectiveness studies, investment strategies, business restructuring, internal controls, supplier negotiation, customer service design, financial analysis, cost accounting, risk management and budget management. This is a short list. Elias has a unique vision and the right tools to effectively analyze your organization and provide a plan to maximize on your financial opportunities. Diana was born in Merida, Yucatan. She graduated with a BA in Business Administration from Marist University and is currently pursuing a Master’s in Finance at UADY. Diana is a lover of languages and combines her experience and studies with the passion for connecting with people. She feels there is a culture in language that helps to better understand an individual’s perspective, needs and motivations. Diana speaks fluently in English and Spanish and has a fundamental grasp of German. She spent a semester abroad in Nantes learning French. As Project Manager she leans on her experience working in the hotel and travel industry where a focus on understanding client needs yields the highest level of customer satisfaction. Diana’s approach typically begins with effective listening and continues with thoughtful questioning. She strives to end interactions with solutions that bring measurable results. She has extensive experience with international travel, meeting/convention management and the logistics associated with both. Diana enjoys motivational speaking engagements and serves as an expert for discussions about securities. She teaches economics at the Colegio Peninsular Rogers Hall here in Merida.